JPD Worldwide calls THE EXCHANGE an unrivalled tool for driving sales and changing customer buying behaviour. It’s a fun and interactive hospitality based selling tool that turns venues into virtual stock markets, and engages with customers by putting their drinks on a live stock exchange for the night. Picture the scene: Prices of drinks are rising and falling on screens all around the bar based on what it being bought and not bought. The bar owner is in control at all times, selecting the products that it wishes to ‘float’ on the stock market in advance as well as the minimum and maximum prices, and by scheduling any market crashes around pre determined times. The buzz that is generated from this selling method is encouraging customers to extend their visit, return week after week, and increase their spend per head. 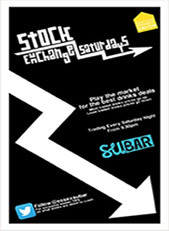 In fact one EXCHANGE customer increased its daily turnover from £1,500 to £8,000 just by running a drink exchange night. Overall, vendors running the system are finding that approximately 90% of sales on the night are made up of featured products and bar revenue has been known to significantly increase in just four weeks; gross profit has even been known to go up. THE EXCHANGE is currently proving to be a great tool for both entertainment and revenue at Essex University Students’ Union that use it as a regular Saturday night event feature. Peter Coxell, Senior Bars Supervisor reports on recent activity where for just £50 the university created the biggest night of Freshers week: “THE EXCHANGE was definitely a hit this week, and Saturday had our highest takings for the whole of Freshers week, so it was a big success for us”. With such great reports we couldn’t resist finding out more about this unique, inexpensive, and remotely managed selling tool. 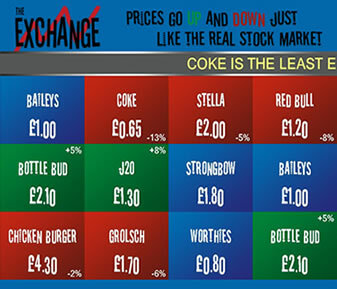 When running live THE EXCHANGE utilises existing TV screens to display drinks’ prices to customers. The customer makes their selection and orders at the bar as usual; when the bar tender rings the drink through the price automatically matches the price on the screen. Once a specific item has sold, it will rise in price so the next customer pays a little more. If over time a product is not sold it will begin to drop in price – just like the global stock markets. The technical bit - THE EXCHANGE software runs locally on the vendor’s existing PC and EPoS system, and is installed and configured in approximately fifteen minutes by JPD Worldwide. After installation, a convenient 30minute telephone training session is given to instruct the user on the how the system works and answer any further questions. The only technical activity the user needs to do is link their PC to their TV system, but JPD Worldwide is on hand to advise if required. Following installation and training, a set-up wizard helps the user to create each promotional event, which can also be done remotely, and is then displayed on any number of TV screens throughout the venue. THE EXCHANGE is an ideal product for a bar, pub or club looking to generate interactive activity and then to attract and keep a lively crowd. Technically THE EXCHANGE isn’t designed for retail. However, although aimed at the hospitality market THE EXCHANGE could work well as a promotional or sales event for a retailer looking to boost sales during quiet periods and seasonal holidays. Real-time trading screens - Drink prices are permanently on display to customers and rise and fall depending on what is being bought. Market crashes - On occasion through out the night pre-selected products drop massively in price, causing a surge at the bar. Automatic event scheduling – Drinks prices are automatically updated within the venue’s EPoS system and remain up to date before, during and after events. Social media - Customers get red-hot trading tips via Facebook and Twitter. Remote management – Events can be scheduled and managed remotely via an online user login. Drive volume/margin - The user can drive volume/margin as they wish by selecting the products to ‘float’ on the stock market, and minimum and maximum prices for each. Avoid downtime - The user can schedule market crashes to coincide with quiet periods or traditional exodus times that in turn create buzz and drive sales during natural lulls. Easy to install - THE EXCHANGE is compatible with most EPoS systems and is currently up and running on sixty-four different systems (with more being added almost weekly). Easy to use - Prices are automatically linked with the venue’s EPoS system so the bar tender can enter and take payment for drinks as usual. It is down to the venue to link the relevant PC to the TV screens. Generally this is easier than it sounds! Although the software is powerful and can be hugely beneficial the event still needs promoting to get launched. On occasion it has been seen as magic which just needs switching on – this isn’t necessarily always the case. Installation is free of charge; the client only pays when they run an event at a cost of £50 plus VAT paid via PayPal, Credit/Debit card, and there is no minimum use or contract. To book your first event just call 08450950103, as a special offer for epos.co.uk users if you quote the code EPOS14 before the 31st December 2014 you'll get your second event free of charge, a saving of £50. Just call 0845-095-0103 to arrange your first event. If you quote the code EPOS14 you'll get your second event free.